McConnell says he won't allow the bill onto the floor. So Sen. Mitch McConnell (R-Scum) just gave the go-ahead signal to Trump: He says he won't allow legislation to protect Bob Mueller from being fired. He told Neil Cavuto last night on Fox he doesn't believe Trump will fire him -- and he doesn't want the bill on the floor. "I don't think he should fire Mueller and I don't think he's going to," he said. "So this is a piece of legislation that isn't necessary, in my judgment. "I'm the one who decides what we take to the floor, that's my responsibility as the majority leader, we will not be having this on the floor of the Senate," he said. Cavuto asked our own Yertle McTurtle if he'd be shocked if Trump fired Mueller. 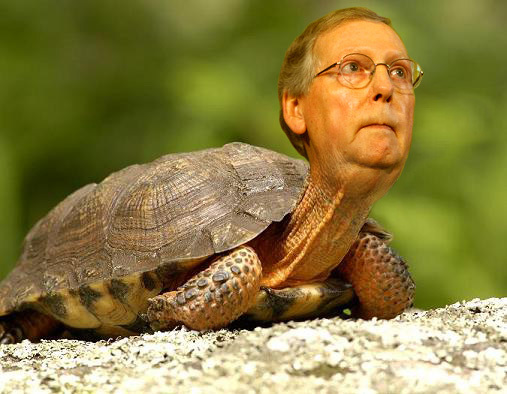 "Yes, I don't think he should and I don't think he will," the turtle croaked. A bipartisan group of senators introduced a bill last week that would make it harder for fire Mueller, stating that the special counsel can only be fired for "good cause" by a senior Justice Department official.